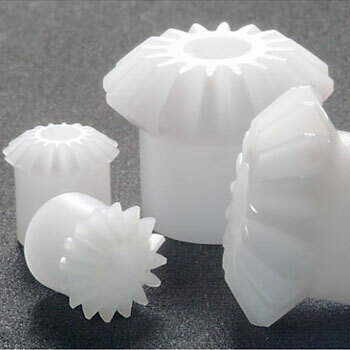 Moulded plastic bevel gears in metric module pitches with ratios from 1:1to 5:1. 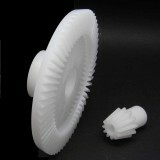 These gears are suitable for a range of applications and are sold in pairs. 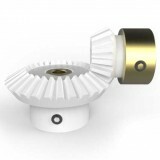 *NB: These gears match with 60 tooth bevel gear only. Their geometry is not compatible with other gears. 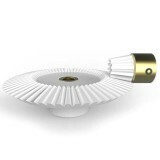 Plastic and Brass Bevel Gear, 20DP (1.27mod) pitch, 1:1 ratio with Brass insert and Set-screw fixing. Sold in pairs. 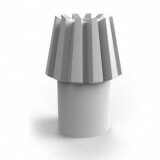 Select from our range of Bevel Gears below. The product selling unit/price is per PAIR. 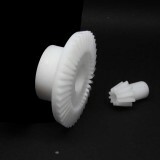 Pair Bevel Gears, 0.5 MOD,16 T, 3mm Bore .. 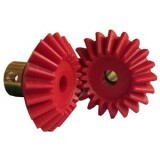 Pair Bevel Gears, 1 MOD,16 T, 5mm Bore .. Pair Bevel Gears, 1 MOD,16 T, 5mm Bore, Brass Bush, Set Screw .. 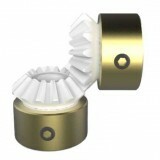 Pair Bevel Gears, 1 Mod, 15 Tooth + 30 Tooth .. Pair Bevel Gears, 1 Mod, 15 Tooth + 30 Tooth, Brass Bush, Set Screw .. 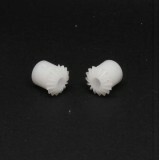 Pair Bevel Gears, 1 Mod,15 Tooth + 45 Tooth .. Pair Bevel Gears, 1 Mod,15 Tooth + 45 Tooth, Brass Bush, Set Screw .. 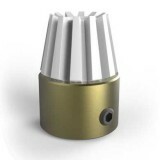 Pair Bevel Gears, 1 Mod, 10 Tooth + 40 Tooth .. Pair Bevel Gears, 1 Mod, 10 Tooth + 40 Tooth, Brass Bush, Set Screw .. 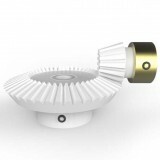 Single Bevel Gears, 1 Mod, 12 Tooth to go with set GB1M512060 .. 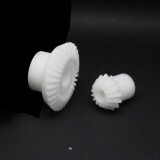 Pair Bevel Gears, 1 Mod, 12 Tooth + 60 Tooth .. Pair Bevel Gears, 1 Mod, 12 Tooth + 60 Tooth, Brass Bush, Set Screw .. 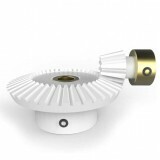 Single Bevel Gear, 1 Mod, 12 Tooth to go with set GB1M512060, Brass Bush, Set Screw .. 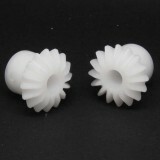 Pair Bevel Gears, 20DP, 20 T, 4mm Bore + Setscrew. 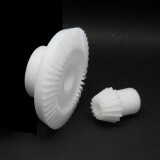 These parts are priced/sold in pairs ..